« All flabbered up in the gaster. I’m not saying “THIS IS THE YEAR!” because I promised you I wouldn’t do that no matter how rosy my Cult of Personality glasses make everything seem. I looked at a pile of dog poop the other day and it looked like a chocolate doughnut. These glasses are of the strongest rose-colored prescription money can buy. I must let you know that the Pittsburgh Pirates spent a sunny Florida day bitchslapping the Manatees stupid. You may not expect to win as a Junior College baseball team heading into a Major League Spring training game against the Pittsburgh Pirates, but you hope to learn something from the experience. The SCF Manatees learned a lot about themselves and what it takes to be a professional baseball player Friday afternoon as they were handed a 21-1 loss to the Pirates in the opening day of Spring baseball at McKechnie Field in Bradenton. This is noteworthy because the Manatees have beaten the Pirates before. So we didn’t just beat them this time, we destroyed them the way a MLB team SHOULD destroy a junior college baseball team. They should be bleeding and crying and reverting to thumb-sucking pants-pooping babies by the time the game is over. In addition, the Pirates beat Tampa Bay 10-3 in their second Grapefruit League game of the season. Which is already pretty rosy and then I look at it through my rose-colored glasses and I see a World Series pennant. These glasses are better than ecstasy. Again, not saying this is the year. Just saying the Pirates are not looking terrible yet and that Bitchslapping Manatees would make a kickass band name. my girlfriend is a RedSox fan and was making fun of me for being a lifelong Pirates fan – my big mouth and I told her that if the Pirates somehow make it to the World Series this year, I will pay off her car – so can we just hope to maybe have a winning record, and if a miracle occurs, lose the NLCS? The Battlin’ Buccos dropped their Grapefruit League opener to the Tampa Bay Rays, 9-5. They came back to even their record the next day, 10-3. Not to worry, Dan. All the rootin’ in the world ain’t gonna put the Black & Yellow in the WS this year, but if we’re all real nice and send ’em some money (er, I mean, go to the games in increased numbers), they may win 80 games by the end of the decade. On the bright side, a little birdie told me Jane Orie is interested in the manager’s gig, when Clint can’t clear the hurdle. Bob, thank you for the correction! Where can I get a pair of those glasses? Dan – the deal should have been: if the Pirates make the World Series, your girlfriend pays off YOUR car! Bitchslapping Manatees makes a great band name because it automatically offends two groups of people: PETA and raging feminists. On the other hand, Raging Feminists would make a great band name. As usual, just sayin’. *–Seen on a sign outside a Claire’s-type store in a mall. Pirates will need more help than ever before. I’m with Maggie K, I want a pair of those glasses so I can see the “economy” a little clearer. Maybe I’m just old school but I wish MLB would get rid of the pajama pants. This is off topic but I just saw that Hines Ward will be on DWTS. hmmm…skinny britches, low cut shirts and sequins??? All sexified? hope they dance to the polka! Just got off a plane in Philly — 3/4 of the folks waiting in the terminal were wearing Phillies jerseys — oh how I long for the days when the Buccos were contenders. I can’t jump on the Bucco brigade — just too old & jaded. I finally outed myself as a lifelong Pirates fan to some of my friends at the dog park. I got ridiculed granted, but then I reminded them they are Carolina Panthers fans. That worked! Here is to hoping for a season where my shame is beaten by a plus .500 record. That is all I hope for. 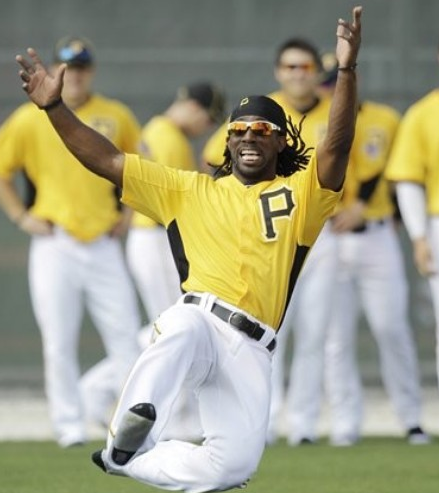 I love that photo of Andrew McCutcheon.